everyday-, sport- and outerwear. 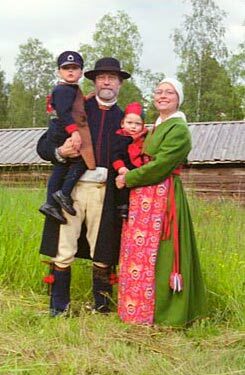 We also produce and alter Swedish folkcostumes, particularly from Dalarna. As you plan your holiday shopping, remember we have unique cards and gifts here! For example, books, woodcrafts, bags, scarves, tableclothes, hats (like in the photo above), aprons, socks, handknitt sweaters and hats, jewelry, leather, buttons, buckles, and ceramics.